Prior to 1970 help for disabled people and their families was really only available through the health service (medical social workers) or voluntary organisations such as the Invalid Children’s Aid Association and the Spastics Society. A few local authority health departments set up professional social work services in the 1950s, staffed mainly by medical social workers and in some cases occupational therapists as well. Welfare departments in the pre-Seebohm days also offered services to disabled people, but as most did not employ trained social workers little was done beyond material help and information-giving, while some provision was made for residential care. However, the Seebohm Report, local government reorganisation and the Chronically Sick and Disabled Persons Act 1970 was supposed to change all that and usher in a new era. Following this a number of other developments and reorganisations of social welfare, in particular the community care ‘reforms’ of the 1990s through the National Health Service and Community Care Act 1990 but also the Disabled Persons (Services, Consultation and Representation) Act 1986, the Children Act 1989 and the more recent Community Care (Direct Payments) Act 1996 have transformed the organisation of the statutory social services. 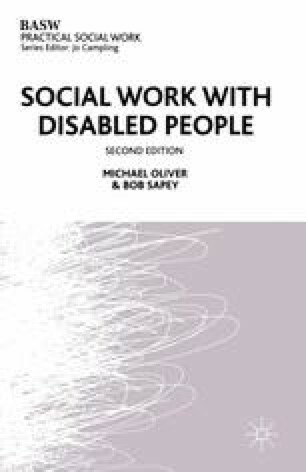 Just what this has meant as far as social work with disabled people is concerned will thus be a major theme of this book.